That totals +10 mining skill, and this is crucial advantage at start. So if we merge those two things into one conclusion. With 465-470 mining(read below chapters) + 5(or +10) skill increased, you can skip Mount Hyal or Vashj'ir, because that area will be so overcrowded with levelers and other miners, that there won't be possible to mine fast. If you have a lot of money, you can ask few friends with mining profession, to mine Obsidium ore for you so you can smelt it. This is probably the fastest way to gain the achievement. This is very expensive methode. Ask your friends to buy Obsidium and Elementium ore while you mine, so you can HS and smelt it and gain those last skills before 525. Count on this only if they can get a lot of ore in first half hour on ah(that's doubtful), because there will be first 525 miner in less than hour or faster. Advantage of mining Saronite ore in Wintergrasp, that there will be no one there anymore. Rich saronite ore is still yellow and Saronite ore is green. Titanium is brown. Mage friend can help with portal. If you are mining in Wintegrasp, equip your enchanted gear after you gain 465 skill and HS near Deepholm. You can otherwise imediatelly go to Mount Hyal, and try to raise your skill to 465-470. Just go far away from quest starting zone, because of gankers and other people. 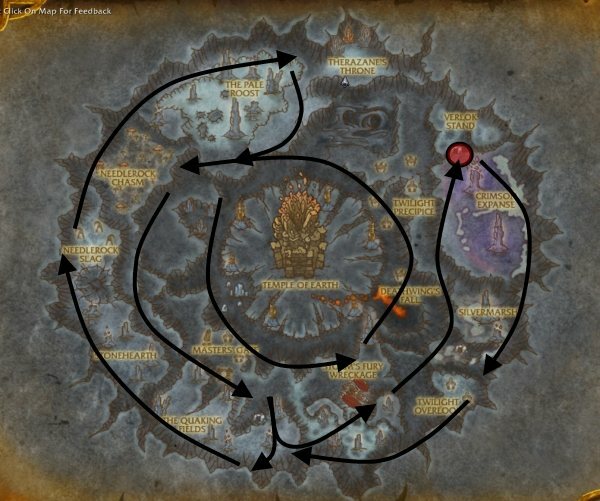 Skip overcrowded areas like Mount Hyal or Vashj'ir! If you did what was written in chapter 1 of this guide, you can continue with leveling your mining in Deepholm while gathering Elementium ore.
With 475 skill atleast, start mining in Deepholm. Deepholm is literally loaded with Elementium wherever you go. Have in mind, that adds are level 82-83. Advantage of jumping in Deepholm is that you avoid other people that will level or mine in Mount Hyal or Vashj'ir. - AFTER: Train Flight Master's License so you can fly in Eastern Kingdoms and Kalimdor. - AFTER: Train Master riding(310% flying mount speed) if you don't have it already. - AFTER: Equip your enchanted mining gear and heartstone to location near Deepholm(AND/OR ask friends to send you Obsidium and Elementium ore) and good luck. Thank you for the good writeup. It in fact was onnce a entertainment account it.